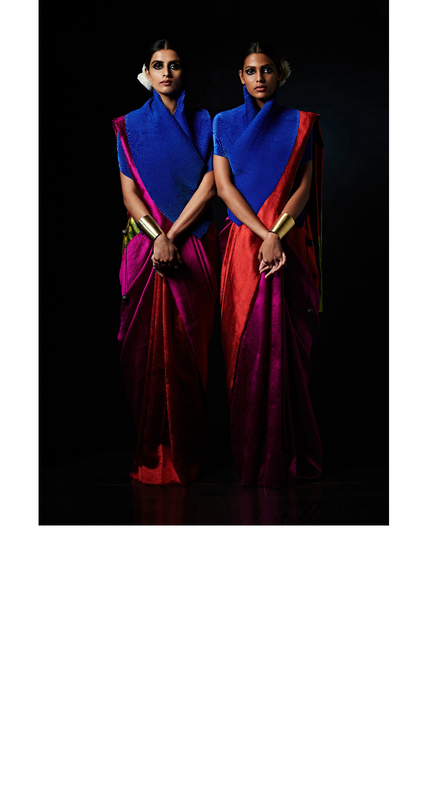 As a Gemini and a sari lover myself, I've always wondered how to make saris even more multipurpose than they already are. 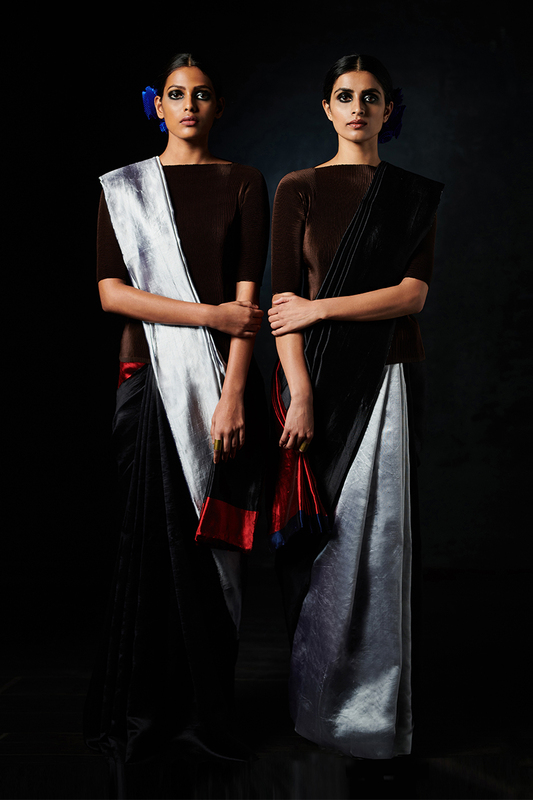 Just as I've committed, as part of our pret offering, to rethink separates to add breadth to our wardrobes, I thought it important to be able to somehow bring that element of surprise to the much loved sari. 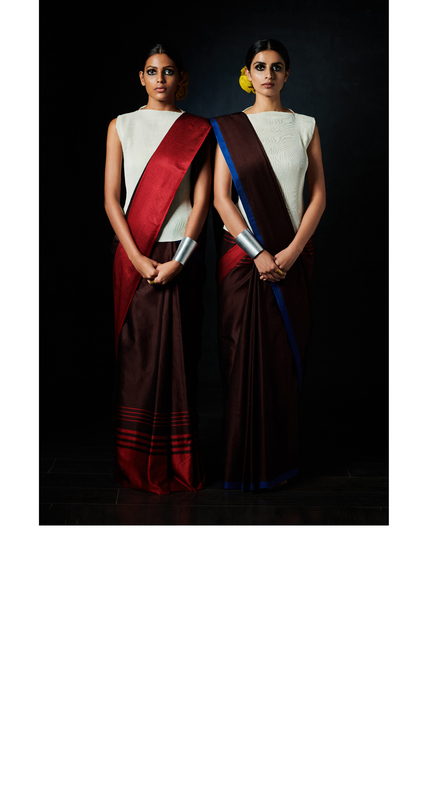 In the past we've teamed our saris with wardrobe staples, the shirt, the blouse, a tee, a tank, a waistcoat and a jacket. 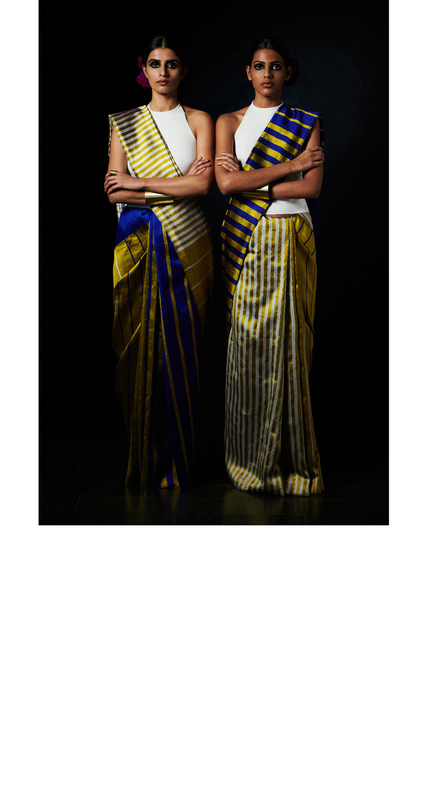 The idea is always to offer our customer flexibility. But what if we could wear the same sari, with the same drape and same blouse yet somehow still make it look different? 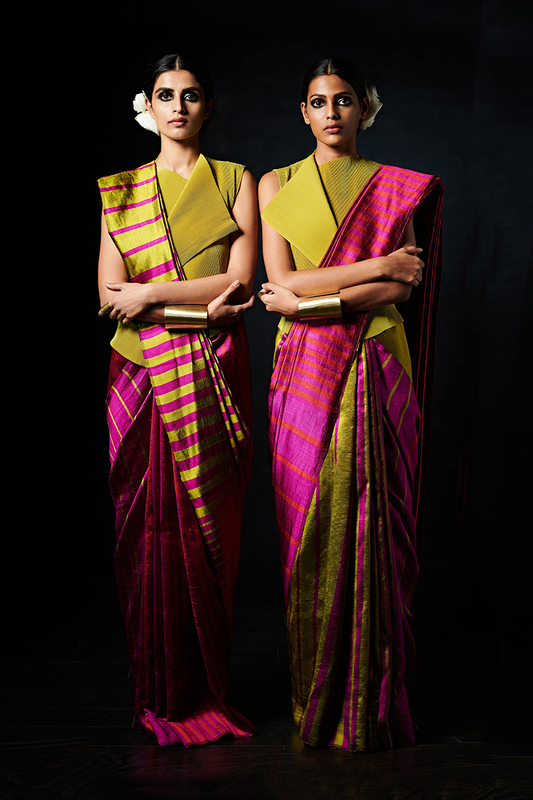 This was the starting point for this line of saris. 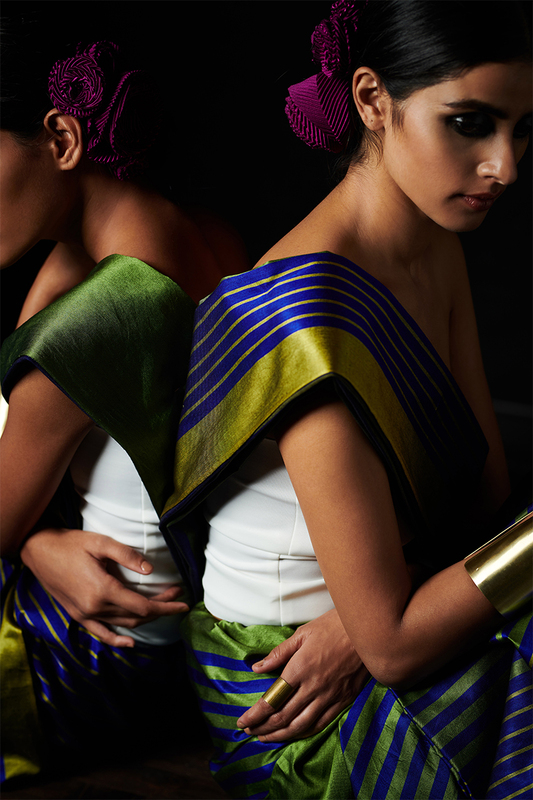 How does one innovate an Indian essential that is already perfect? 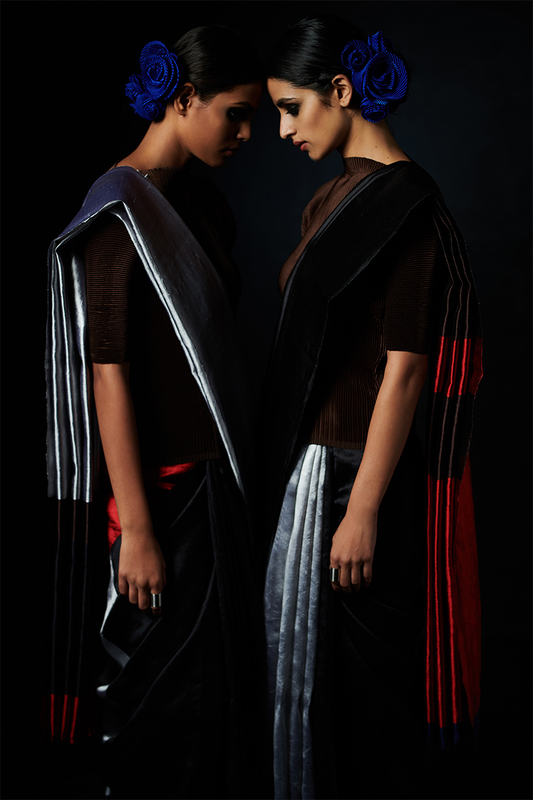 The solution had to be effortless and fuss free. 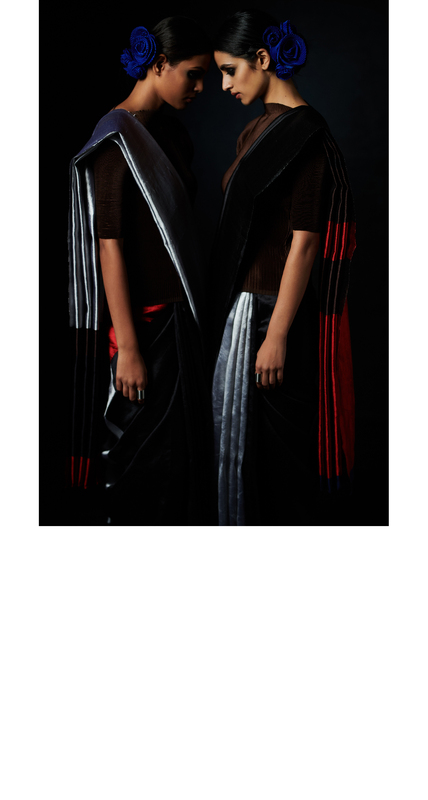 So I conceived them to be 'reversible'. 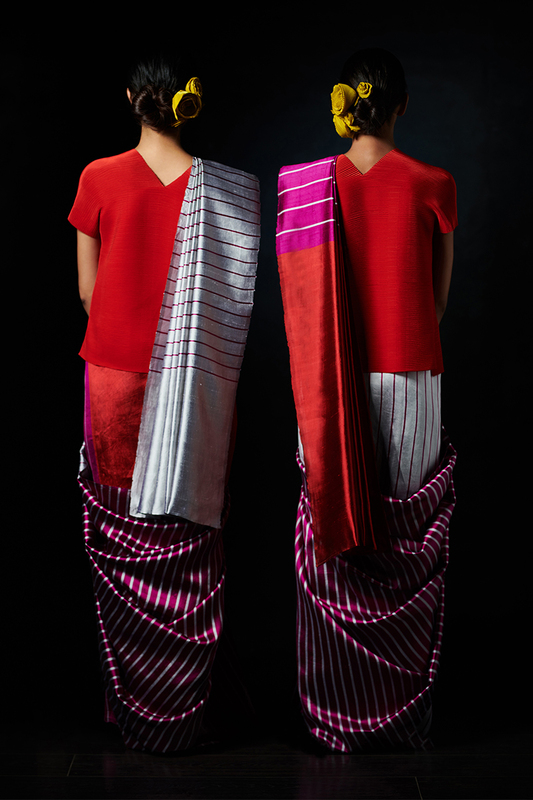 They're designed in a way that they can simply be flipped. 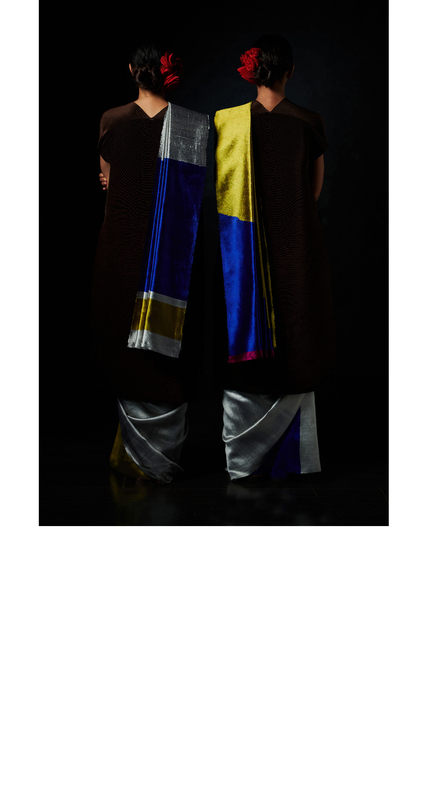 This alters the look in a small albeit significant way. 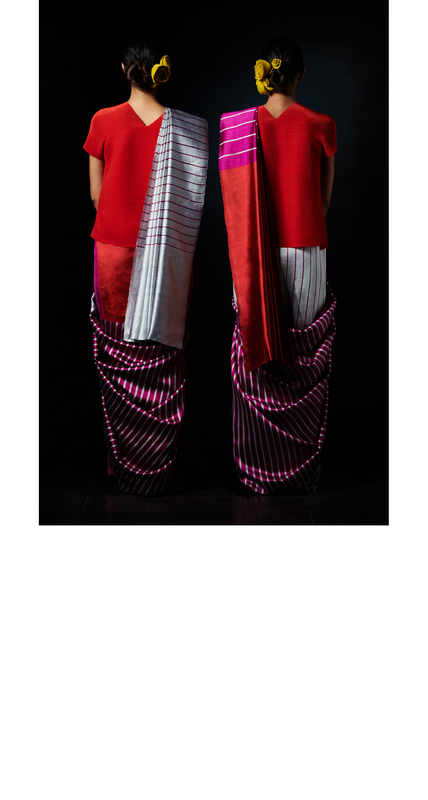 Reimagined to be modular, we can reuse and repeat them and still feel and look a little different each time. 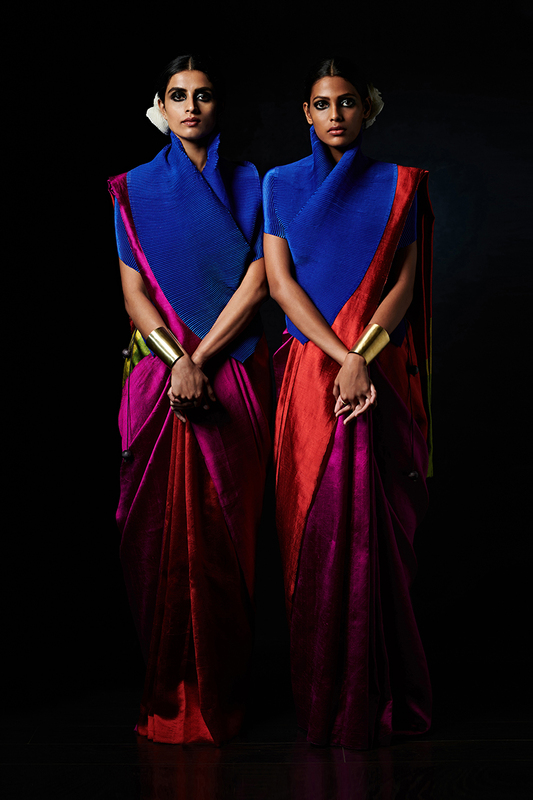 This duality lends itself perfectly to my own personality and this twin zodiac. 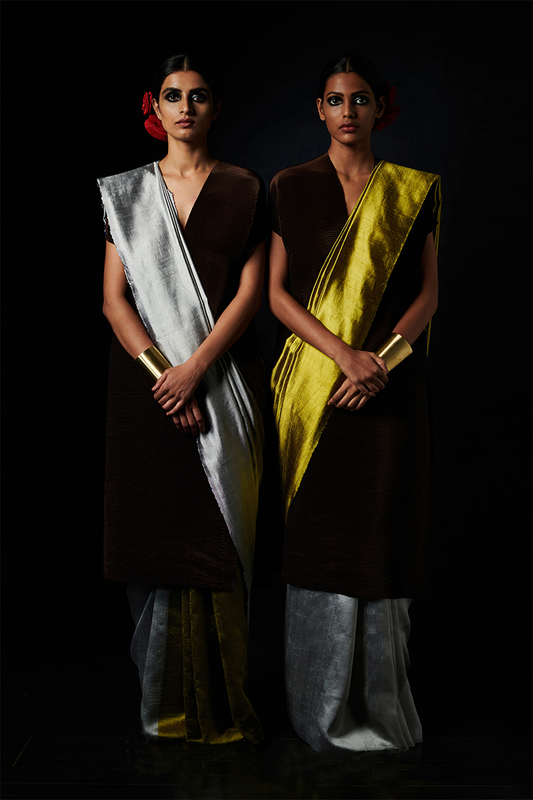 Unpredictable, versatile and expressive it allows the wearer freedom and choice. 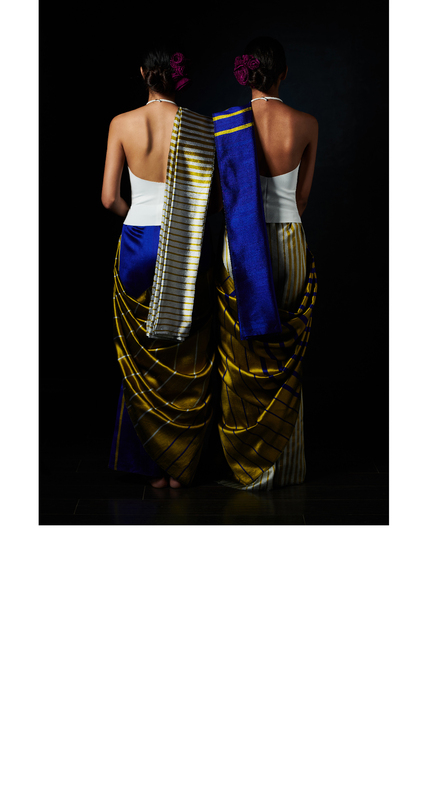 We mirrored the saris to drive the point home, keeping all the other components identical. 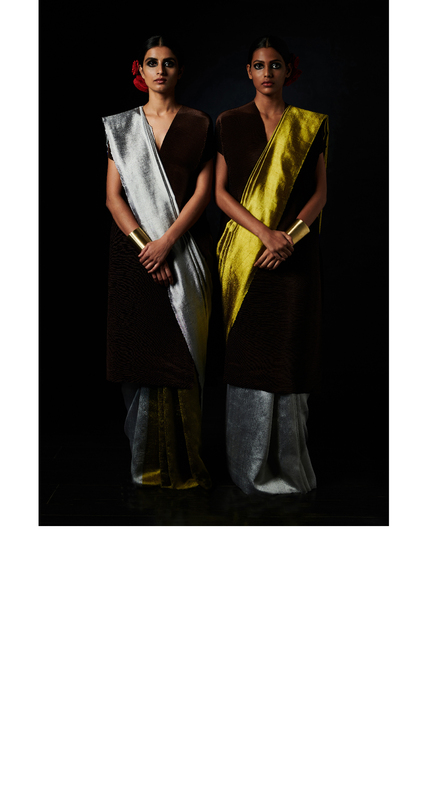 We also added some more shapes that can be alternatives to the blouse. 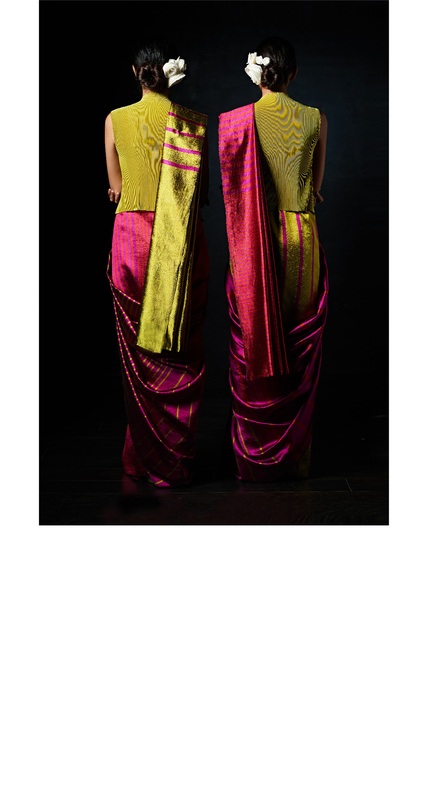 These include our latest offerings of permanent pleated blouses, tops, tanks, waistcoats in addition to our signature wraps and tunics. 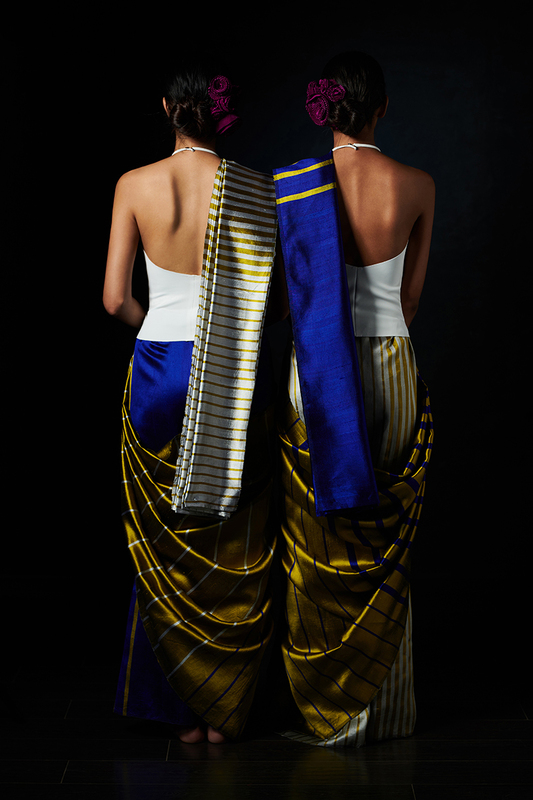 Just in time for the summer, all of these can be worn with other coordinates from your existing wardrobe to be styled as desired without the sari. 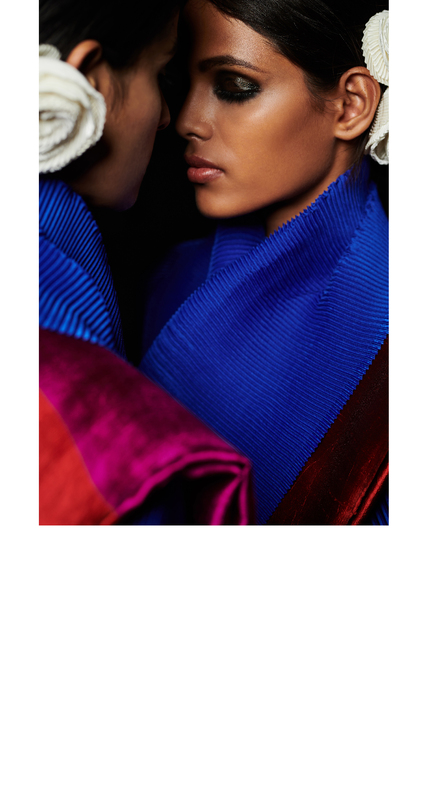 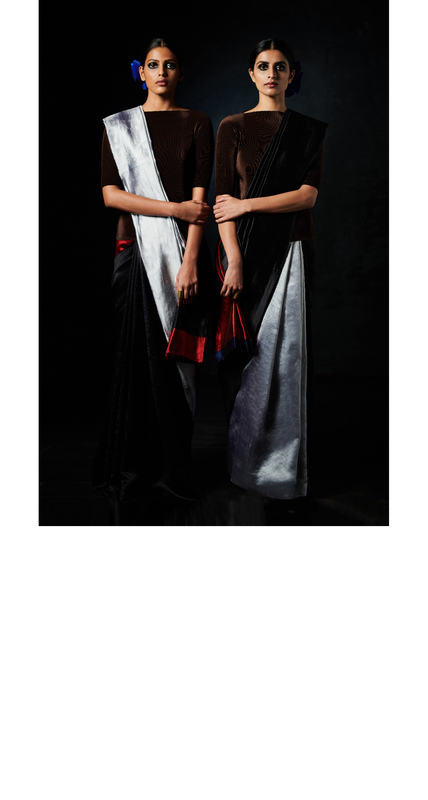 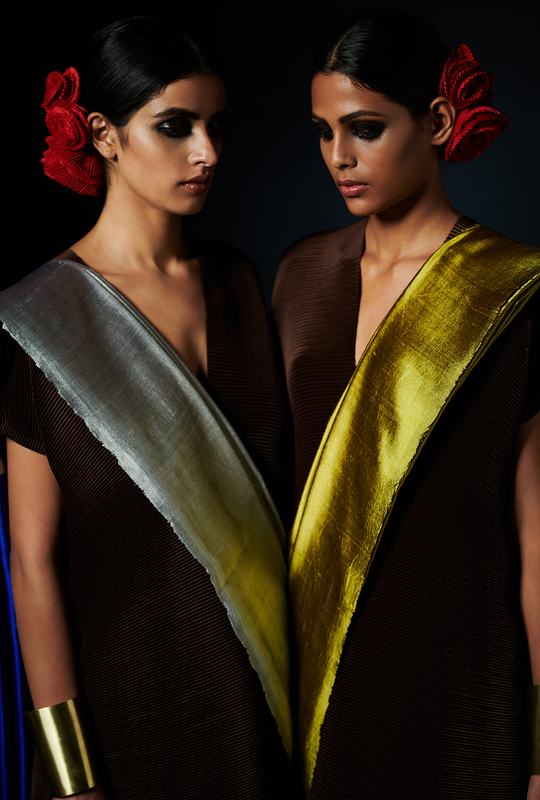 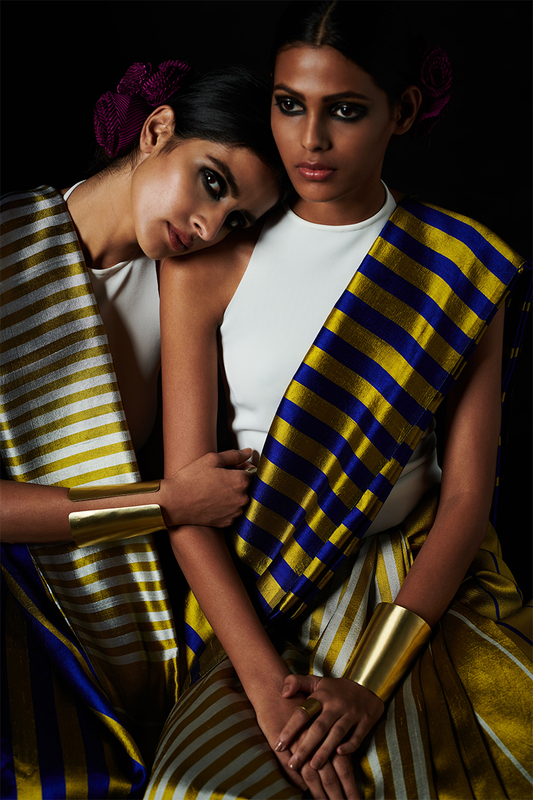 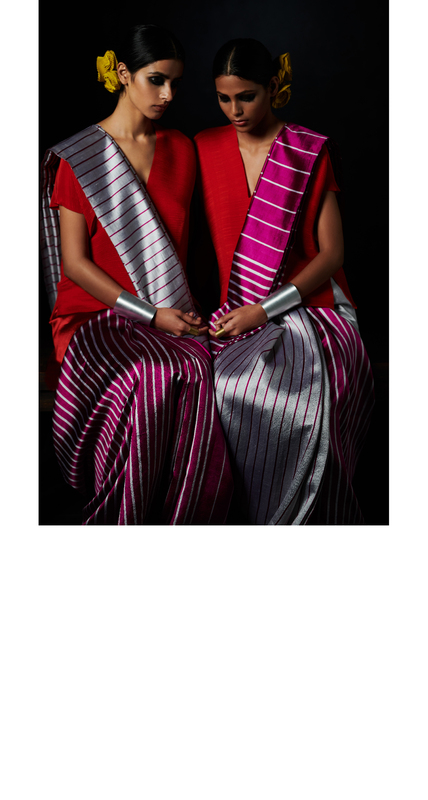 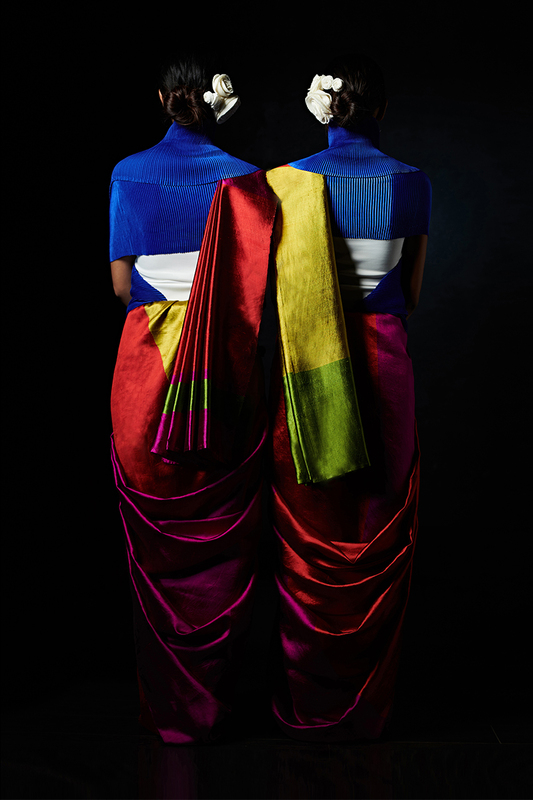 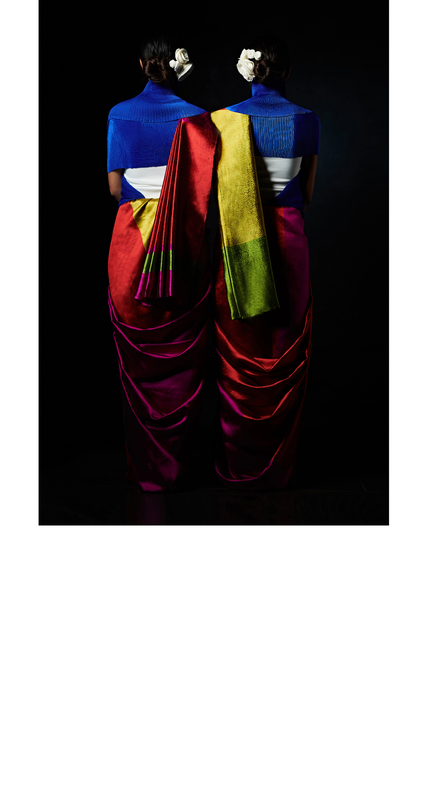 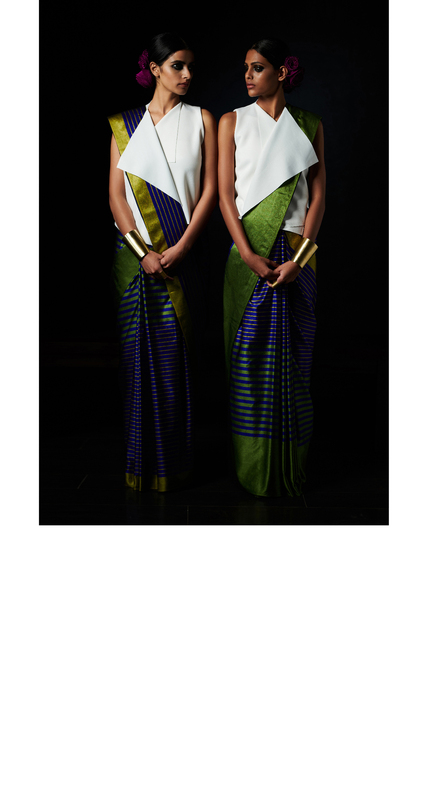 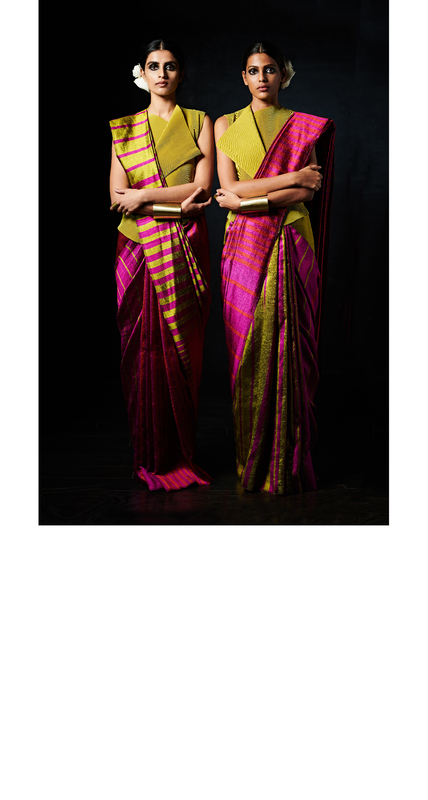 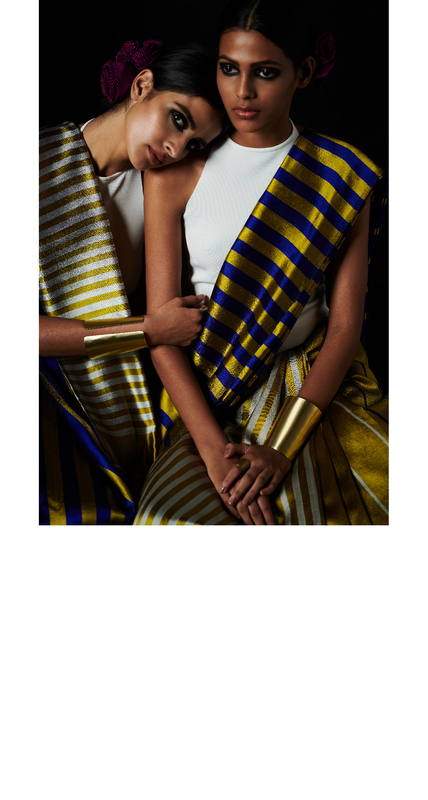 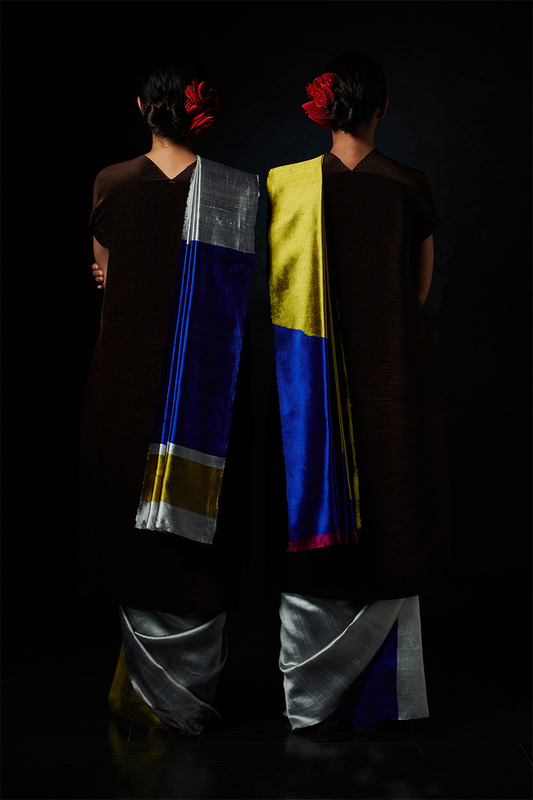 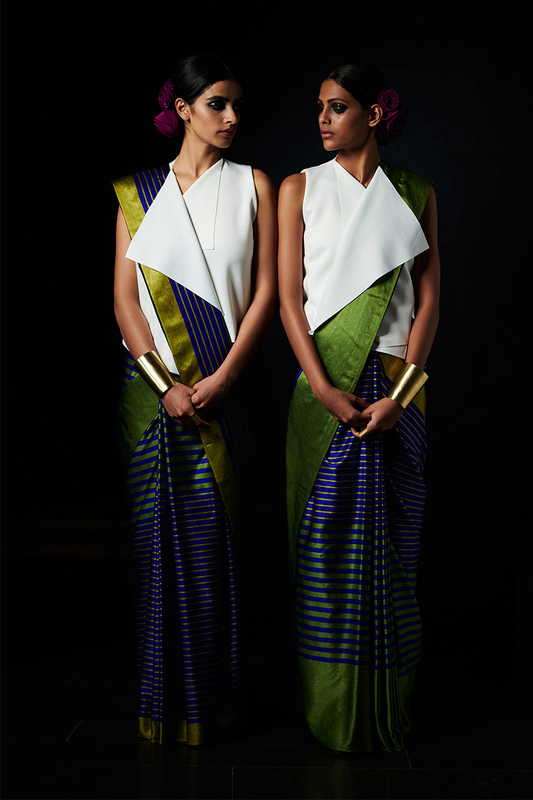 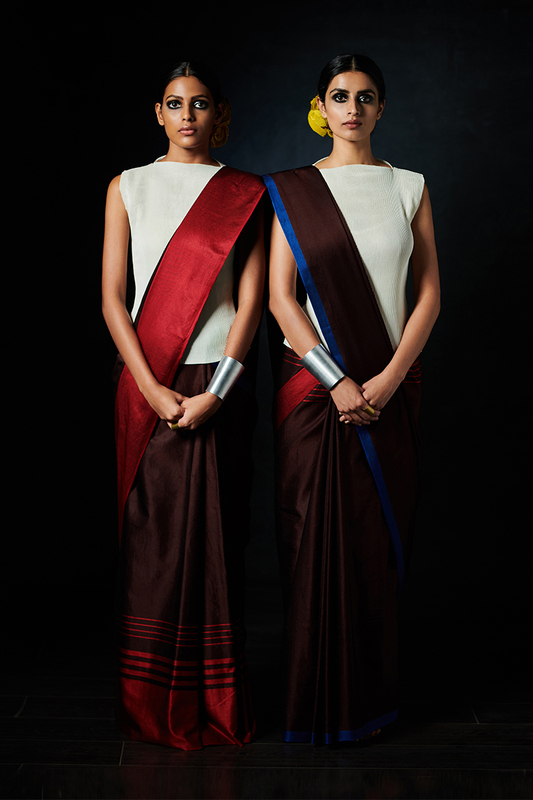 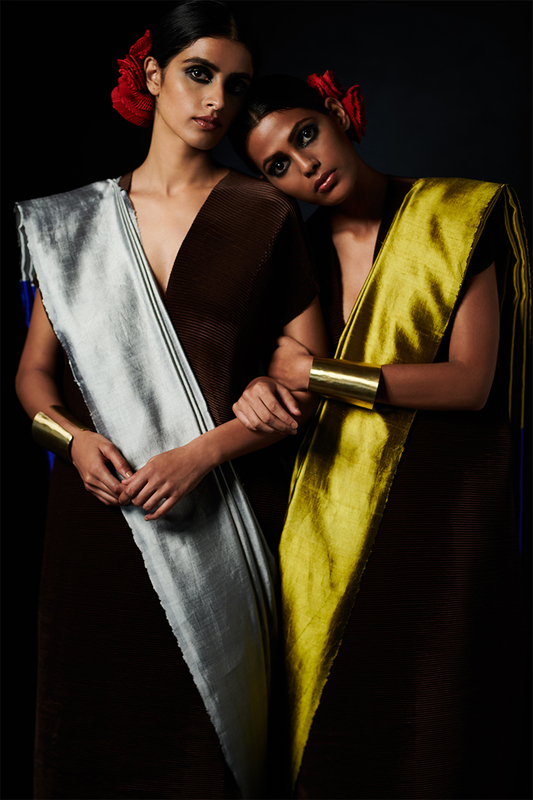 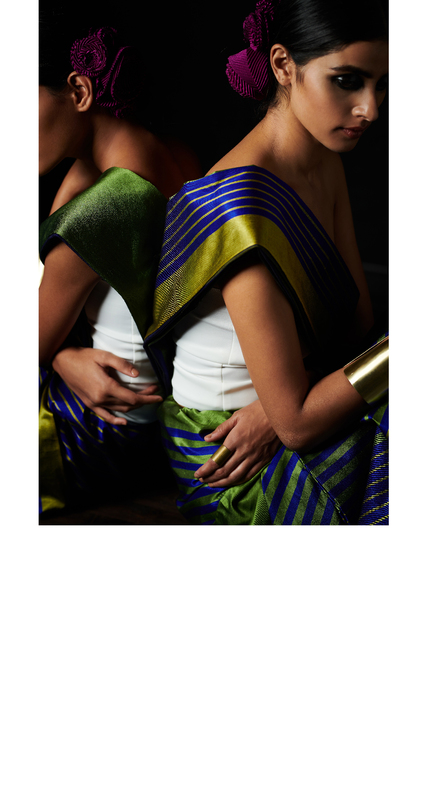 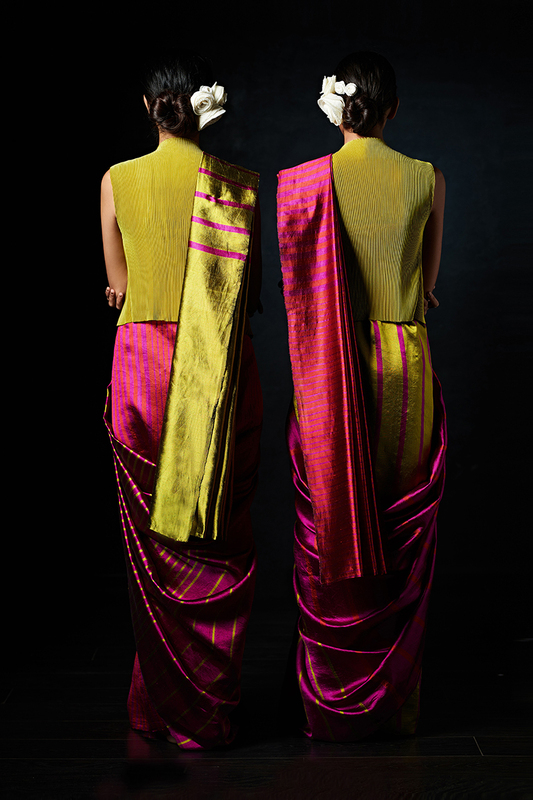 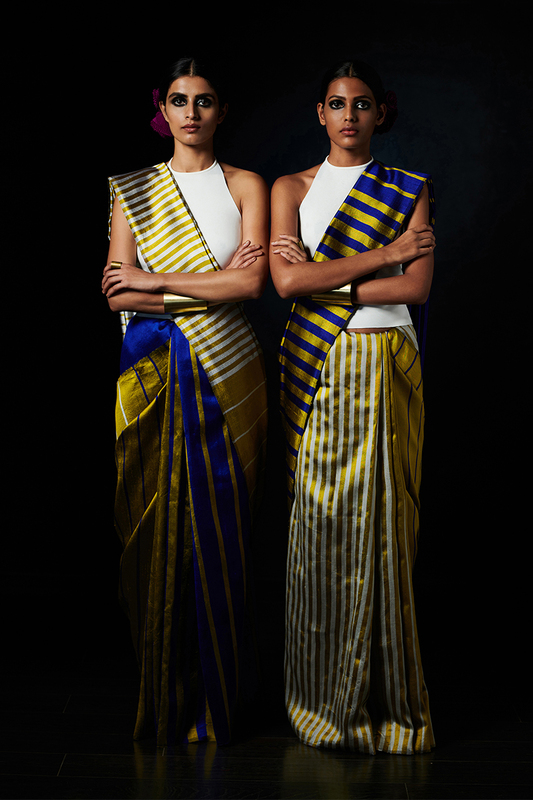 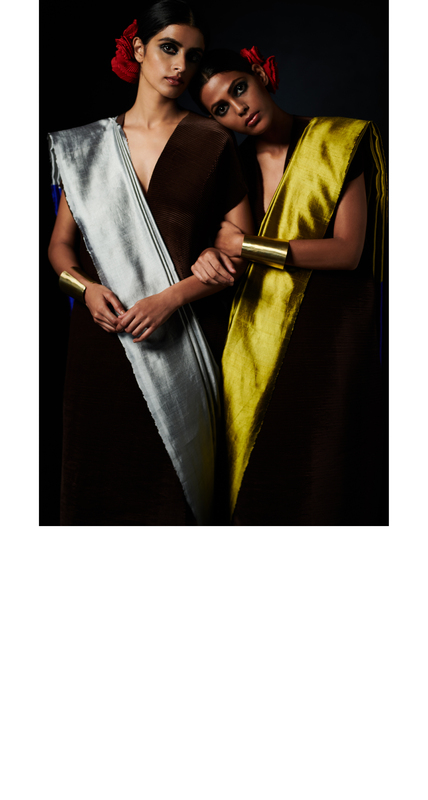 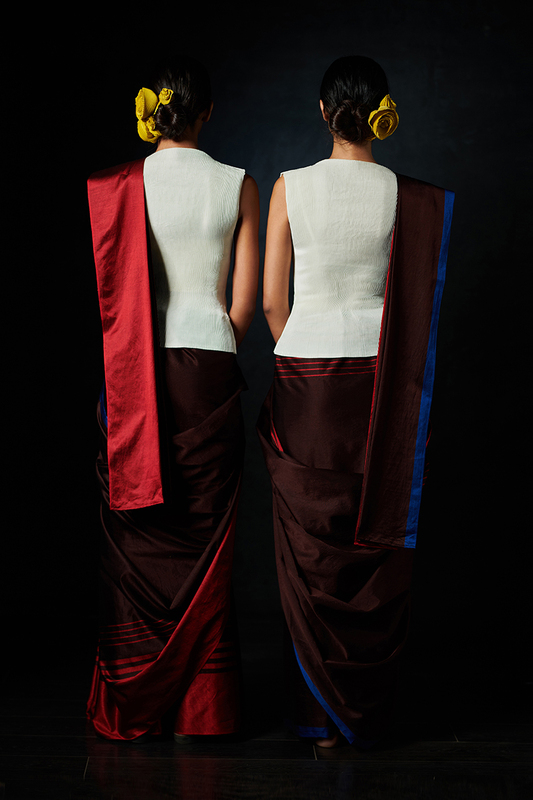 Our saris are hand woven in mulberry silk and cotton, in plain and twill weaves. 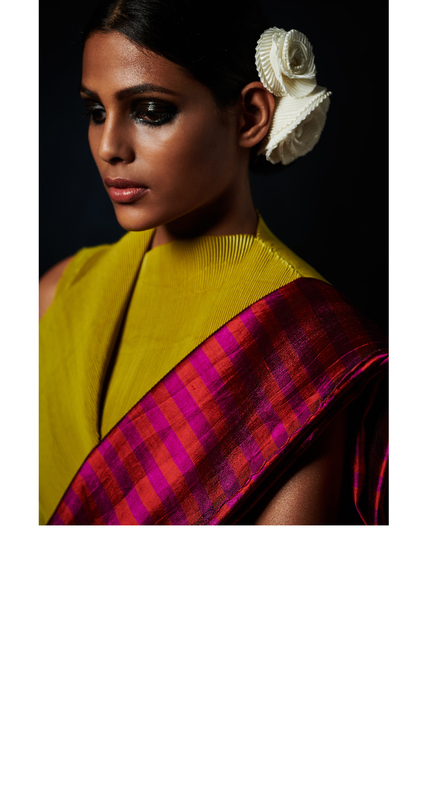 The palette ranges from our bright summer hues of scarlet, citrine, sapphire, chartreuse, magenta to silver, coffee and charcoal. 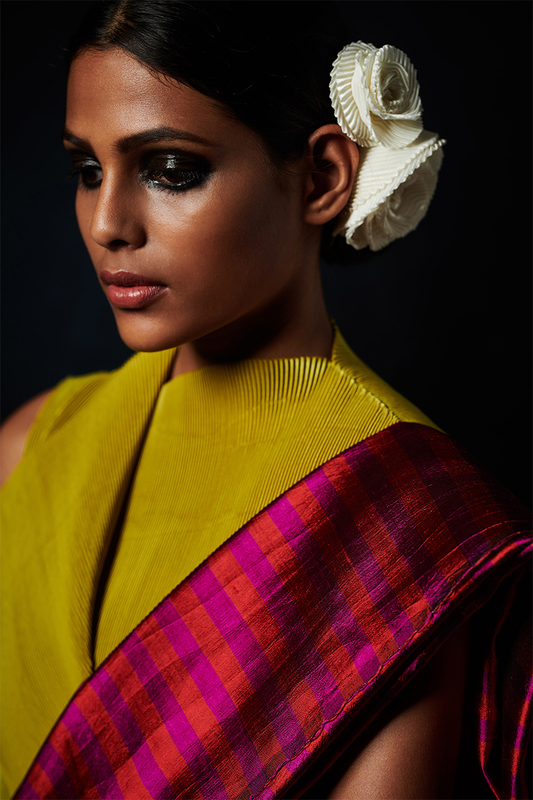 Accessorized with our handmade pleated flowers recycled and created from studio waste to dress the hair, and our minimal Tachi arm cuffs in stainless steel and brass - this collection doubles the fun of styling the sari in a restrained yet luxurious, but dramatic way. 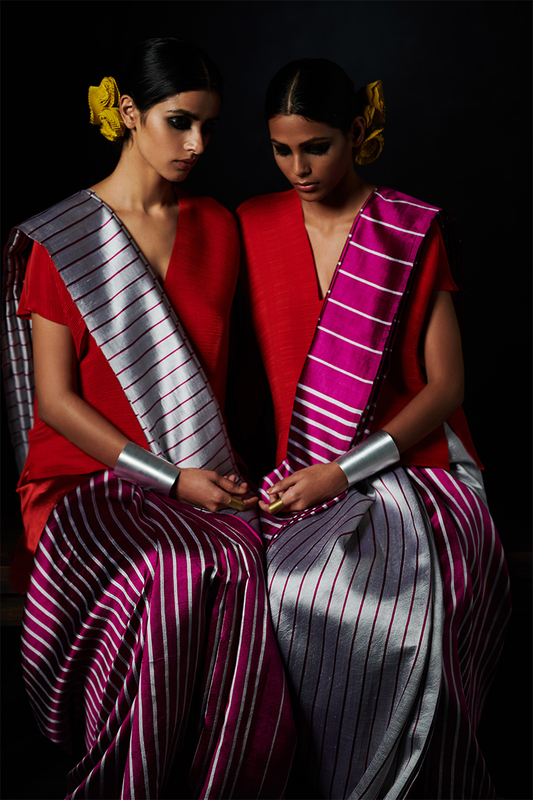 The spirit as always is fierce and feminine, and intrinsically India modern.